You may have spotted baby roaches in the kitchen, sink, bathroom, and in the tub. 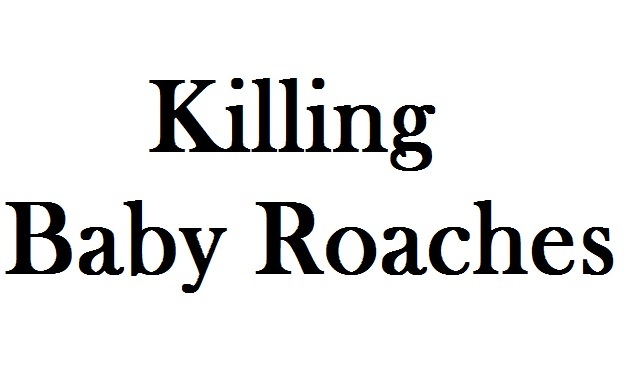 Now, you may be thinking of ways to get rid of baby roaches from your house. Kitchen and bathroom are the most common places where you can find them. Why? Because in kitchen and bathroom, baby roaches find food, shelter, and moist environment which they like. Even, you can also find baby roaches in your car. But, there are fewer chances of founding them in the car. So, today, I will talk the ways for getting rid of baby cockroaches in kitchen, bathroom, and car. So, let’s find out. Borax can be used as a good home remedy for killing baby roaches in the bathroom. You can use borax powder for the job. But, it is a chemical substance, therefore, you should be careful when using it. There are some commercial products available like Harris Roach Tablets that are designed in such a way that, it attracts the roaches in your house, and when they eat it, they will die after some time. It is a good home remedy, but, it is not the best one. There are many cockroach gels present on the market that you can use to kill baby roaches in your car, kitchen, and in the bathroom. Among all of them, Advion Roach Gel is the most popular, and I recommend that you try it once. The benefit of using Advion or any other roach gel is that it attracts the baby roaches and after eating it, they don’t die immediately. They take some time, and in that duration, they spread the poison to their whole colony, and in that way, you will be able to kill a lot of baby roaches. The thing that I like about roach gels is that you can place it on the areas where you see their activity, and there is no need to directly apply on them. You can use gels in the kitchen to kill baby cockroaches in your kitchen, car, and bathroom. Even, some brands also claim that they are safe for pets, in case they eat it. But, it totally depends on the size of your pet, the amount of bait, and the ingredients of the product. If you find a lot of baby roaches in a place, then there is nothing better than the cockroach spray. You just have to spray them, and all the baby roaches will die instantly. But, there is catch with sprays. You would not want to use sprays to kill baby roaches in the kitchen because sprays are just like the foam, and it disperses in the air. Therefore, if you spray in the kitchen, then the vapors of spray will be settled in your kitchen, in the place where you make food. And I don’t like that thing. For me, I will suggest you to not to use sprays in the kitchen, but you are good to go in the bathroom. For catching and killing baby roaches, glue trap can also be used. But, it is not the best solution to this problem. As I told earlier, the best and my personal favorite solution is gel baits. The glue traps work on the principle that, there will be a bait in the center of the trap, and when these crawling insects will come to eat it, they will stick on the paper having glue on it. When you catch a lot of crawling creatures, then burn the trap. But, if you use glue traps, then it is not the permanent solution because you only catch a fraction of roaches, and it will take you some days to eliminate their entire population from your house. It becomes very important to deal with the problem of baby roaches in your home. These baby roaches look similar to the adult ones, just a smaller version of the adult ones. If you ignore the presence of them, then in future, you will a heavy roach infestation in your house. Another thing that you should know about them is that there are many cases where roaches bite humans. In this article, you can see the pictures of cockroach bites. So make sure, you take each and every step for killing baby cockroaches in your kitchen, bathroom, and car. So, I hope that this article helped you. If you have any question that you want to get answered, then feel free to post it in the comment section.